The main objective of using eObservations walkthrough tools is to improve instruction by providing formative feedback to teachers. If your teachers are only accustomed to observations that are evaluative, it is essential that you do some work prior to beginning walkthroughs. Many teachers comment that they have either never been observed or the observations they have had were summative and didn’t provide an opportunity for feedback. In order for your walkthroughs to be authentic there has to be a clear understanding that the observations are non-evaluative and are meant to inspire reflection, conversation and growth. Emphasize that these are short, spontaneous visits in which you’ll be interacting with children, observing the class and then following up with a short conversation about the data you’ve collected. Just as we wouldn’t assess students without giving them a clear idea of an assignment, success criteria or worked examples we shouldn’t begin walkthrough without preparing our teachers ahead of time. Painting a clear picture of the purpose, process and follow-up will create a level playing field for all participants. One activity that I suggest is having teachers brainstorm in groups (by grade level or content) examples and non-examples of each indicator of student engagement. This will not only help them understand the observation form, but will also be an excellent opportunity for teachers to collaborate and reflect on their practice. Another powerful tool is having teachers do mock walkthrough observations using videos of lessons. There are several resources for videos that you can buy, but depending on your school, you may be able to get teacher volunteers to be videotaped. Our teachers view the video clips and mark the data using the Indicators of Student Engagement form. In small groups, they then de-brief about what they saw and the feedback they would give. Once you have communicated the purpose of walkthroughs and teachers have a clear understanding of the indicators of student engagement you can start your walkthroughs. My suggestion is that you begin with teachers that are receptive to the idea of feedback and will serve as cheerleaders for the process. As I stated earlier, the purpose of a walkthrough is to provide formative feedback to teachers to improve instruction; not for teacher evaluations. Teachers need to trust their administrator to provide that feedback in a timely manner that is non-confrontational. Posing a series of reflective questions will start the conversation and enable the teacher to set some goals for improvement. Using this as an opportunity to “catch” the teacher doing something, being subjective in your comments or telling a teacher what they did wrong in the lesson and how to “fix it” doesn’t lead to open conversations about improving instruction. We’ve all heard of (or performed) the “Dog and Pony” show that some teachers put on for a scheduled observation…all you have to do is look at the students’ faces to know that what you’re seeing is not the norm. 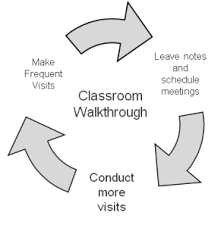 Since a walkthrough is non-evaluative there is no need to announce your visit; teachers should expect to be visited at any time and after awhile your presence will go practically unnoticed by teacher and students. 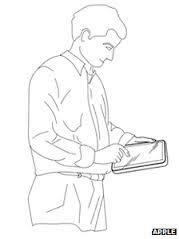 Many administrators carry their tablets with them and pop into classes throughout the day; others have a set schedule. The key is to observe authentic instruction and not a staged lesson. When I’m observing a class I (unobtrusively) walk around to see what the students are doing, ask them questions (What are you learning today? Why do you think you’re learning …?) and focus on what the students are doing. Collecting data will have no meaning if the data aren’t used to improve instruction. Once you’ve completed the walkthrough and proof-read the form (Don’t get me started on ow many forms I’ve read with typos, subjective comments and errors! ), email the PDF to the teacher and schedule a time for a follow-up conversation. The goal is for teacher to draw conclusions independently and come up with next steps. If you need to prompt the discussion with a few probing questions make them open ended and tied to the data. If all five of these elements are in place, your teachers will see a walkthrough as part of their professional growth and welcome you and fellow colleagues (Collaborative Observations is a future post) in their classrooms. This entry was posted in Feedback, Observations and tagged feedback, instruction, observation, walkthroughs. Bookmark the permalink. It’s nice to know that in my building the process of following through is now evident.